Google Chrome has now stunning looks with its new Themes. Google Chrome Theme Gallery is now online and available to everyone for Google Chrome Lovers. These themes are usable on recent developer’s build of the Google Chrome browser. 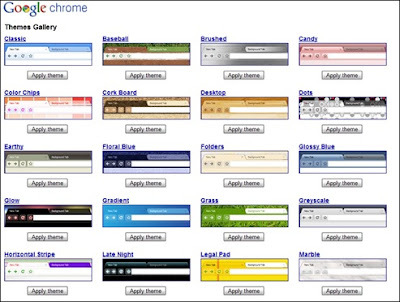 Google has provided around 28 themes which can be installed on your Chrome browser. Cool themes. Gradient and Grass look very nice. Thank you !